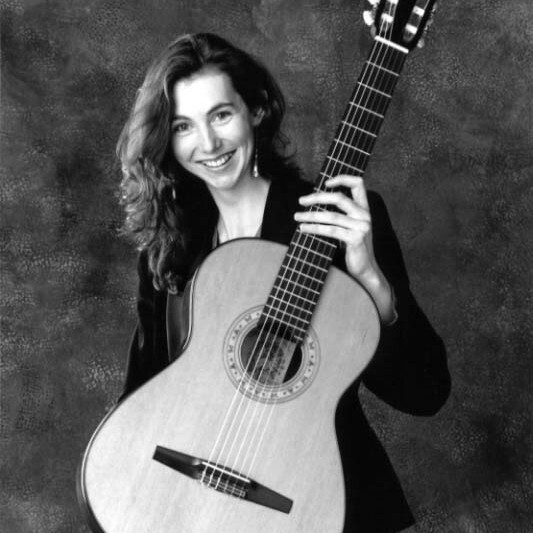 A musician of fiery energy and lyrical expressiveness, Fiona Harrison has a versatile approach to performance, enabling her to adapt to a wide range of performance situations: concerto work, music festival appearances, international guitar festivals and community based projects. She performs as a soloist and ensemble musician, leads masterclasses and workshops, and is highly regarded by those with whom she works. An accomplished young musician of great sensitivity both to her instrument and the mood of the music...gifted with a superbly confident technique. Fiona Harrison gained her degree at the Royal College of Music and continued her studies at Yale University, USA, graduating as a Master of Music in 1992. Having previously won the major guitar prizes of the RCM, she entered Yale as the Leon Brooks Walker Scholar and recipient of an Award from the Countess of Munster Musical Trust. She has appeared on television, broadcast live on BBC Radio and worked with international cruise lines as a solo recitalist. In the USA she has performed in New York, New Haven and Boston; her European appearances include performances of Rodrigo’s Concierto de Aranjuez in the UK and Spain. A superb choice of repertoire is available for concert planning. Works range from the lute fantasies of Dowland and cello suites of Bach, to the passionate melodies of Spain, the haunting chansons of France and the fresh, relatively unexplored music of Australian composers such as Richard Charlton, Richard Vella and Philip Houghton. Programmes will be tailored to suit the varying requirements of different audiences.